This is the 4th year of our participation in the Walk for Wishes. As we have done previously, we will have some people (myself included) participating in the Walk. We will also have a designated spot for any troopers who just wish to cheer on and take pictures with the walkers and runners. I have created a team called "AZ Star Wars Groups" for the fundraising campaign (see details below). As of right now, I am pushing to have our cheer station in the same place as last year in front of Lucille's. I will update this post if I get notification of any course/plan changes. Changing Room: This will be a parking lot change. We usually park near the movie theaters and Bar Louie. Water: Will be provided. I will have a cooler at the cheer station with water and Gatorade. Weapons: No. Only exception is lightsabers. Parking: On south side of complex near Bar Louie and Harkins movie theater. The course has officially changed...again. Please refer to the map provided for details. We will situate the cheer squad at the orange X after the walk begins. We will mingle with the crowd near registration and the stage before the Walk. 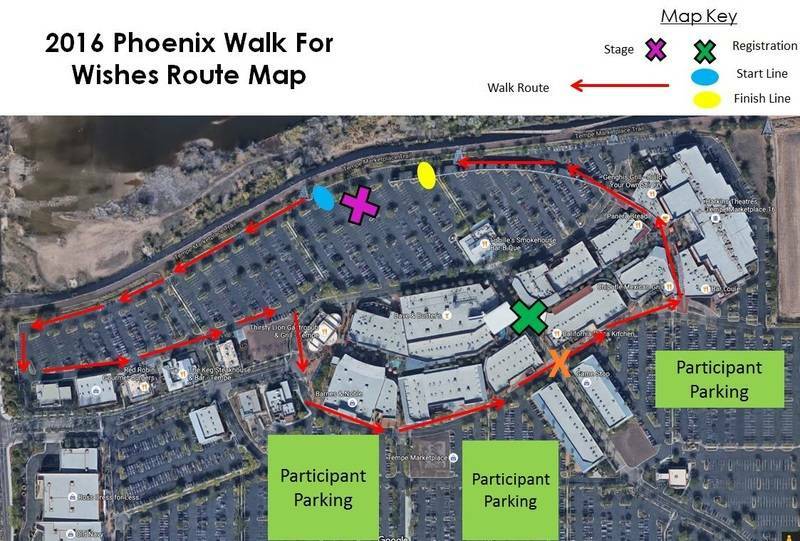 Once the walk begins, the cheer squad can make their way to the orange "X" to greet and cheer the walkers and runners.